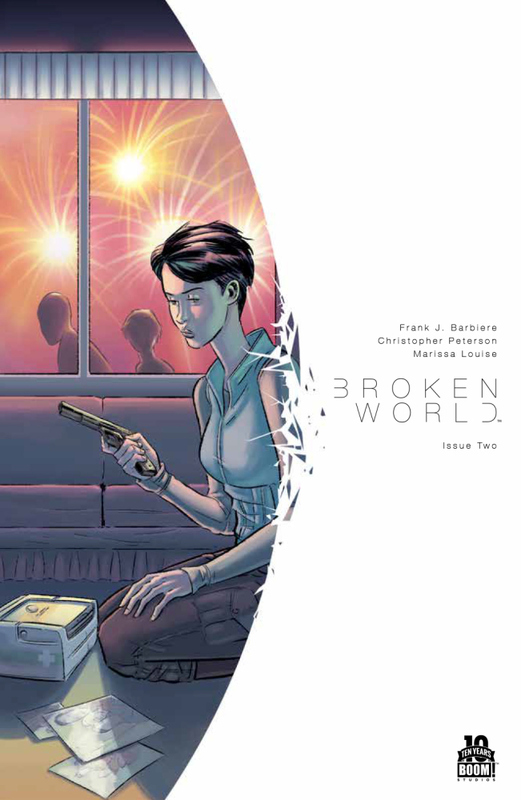 After a great first issue with an unexpected cliffhanger, Broken World #2 deals with the emotional fallout of that event with sadness then renewed hope. Elena Marlowe is determined to reunite with her family at all costs. The world has changed and getting more dangerous. Can she make it off the planet as planned? Days after her family left earth with an impending meteor about to hit the planet, Marlowe is alone and despondent. Artist Chris Peterson does a great job of conveying her sorrow with some wonderfully composed panels with Marissa Louise's gray hues emphasizing her solitude. It's the emotional toll you'd expect when that meteor misses the earth leaving you behind while your loved ones are on an "ark" in space. Marlowe, despite her pain, is determined to join her family. She finds a way to get there and puts her plan in motion but first runs into some students. They have some genuine care for her and let her stay with them. It's a nice touch to see some humanity amid the chaos outside their door. Looters, thieves and just people trying to survive with 75% of people in space have given the earth a post-apocalyptic feel without the apocalypse. Not to mention the aggressive religious cult recruiting people everywhere. Barbiere has set up an intriguing world where anything can happen. In Marlowe, he's established a brave mother and wife left to fend for herself but is resilient and resolute. This impending road trip to the alternative launch site should bring some thrills. Broken World is just an engrossing tale that's just beginning. It's definitely worth adding to your pull list.